Google's latest high-profile acquisition is raising eyebrows worldwide, as the search giant has bought a Boston-based robotics company that specializes in lifelike walking machines built for military projects —creations that have proven extremely popular in online videos. 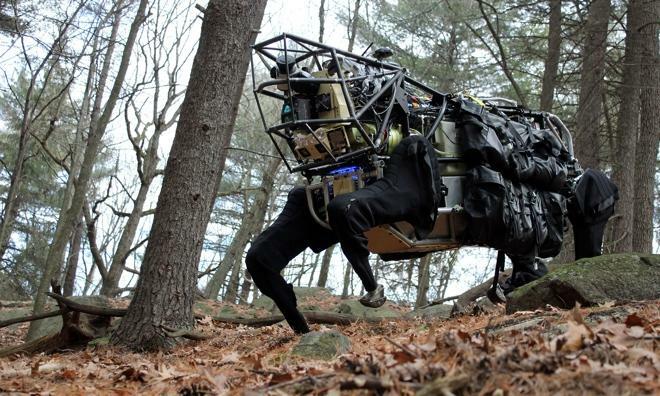 Boston Dynamics has become famous for its advanced robots funded by the Defense Advanced Research Projects Agency. Its most notable creation is "BigDog," a four-legged robot that has gained a reputation online for being both fascinating and terrifying. Google has confirmed to The New York Times that it acquired Boston Dynamics, making it the eighth robotics company acquired by the Mountain View, Calif., operation in the last six months. Exactly what Google plans to do with the technology remains unknown, as does the price it paid for Boston Dynamics. Google did say that despite the purchase of military-partner Boston Dynamics, the Android maker has no intention of becoming a military contractor on its own. Google's robotics team is reportedly being headed up by Andy Rubin, who served as the head of the company's successful Android mobile operating system until March of this year. Under Rubin's leadership, Android became the defacto platform for handset makers such as Samsung, HTC, and LG. One potential candidate for the Boston Dynamics purchase could be Google's interest in self-driving cars. However, that project is said to be part of the company's "skunkworks" division, known as "Google X," which is reportedly a separate division from the robotics arm headed by Rubin. The Google X division is also responsible for the company's wearable Google Glass project, which is currently in testing with developers but is not yet ready for public use. Instead, an earlier profile of Rubin and Google's robotic aspirations by the Times revealed that current plans are focused on manufacturing, not consumers. Google's work could potentially automate portions of supply chain factories to manufacture devices like phones and tablets. Apple is also doing similar work in the supply chain, though its efforts have not come with such high-profile acquisitions. However, it was revealed in November that Apple is investing a record $10.5 billion in supply chain robots and machinery to further automate the production of devices like the iPhone and iPad. Executives at the company reportedly consider Rubin's secretive project to be a "moonshot." But the Times also portrayed it as more realistic than Amazon's "Prime Air" drone delivery service, which it hopes will be able to offer same-day packages dropped off by automated flying machines.